The National Building Code of Canada (NBCC) introduction of apparent sound transmission class (ASTC) rating raised sound control requirements to a new level. 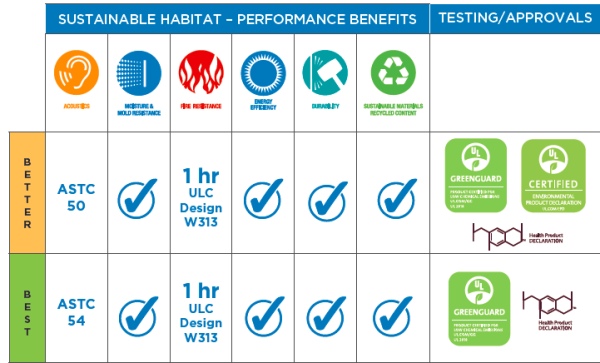 As compared to the traditional sound transmission class (STC) ratings, ASTC ratings provide a better reference standard for comfort and well-being. These ASTC 54 (See illustration) & ASTC 50 solutions are examples of smarter building practices and products that have been tested by the National Research Council of Canada. 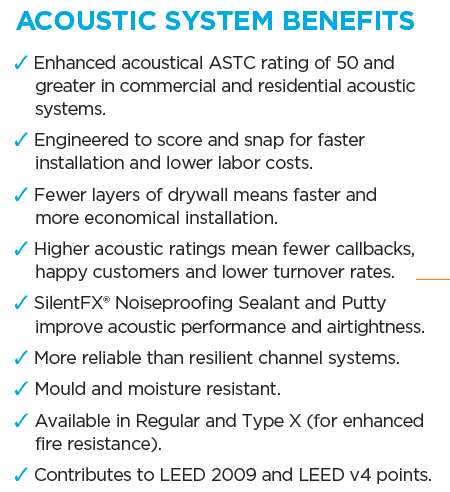 A main provision of the new ≥47 ASTC rating involves sound transmitted through flanking paths. These paths are more abundant in wood frame construction, but with SilentFX® products, you’ve found a direct solution to meeting ASTC ratings especially for the construction of more affordable 6 storey wood frame and taller timber buildings. SilentFX® QuickCut™ Type X laminated core noise-reducing Drywall combined with SilentFX® Noiseproofing Sealant, SilentFX® Noiseproofing Putty and sustainable insulation create a better and best acoustic system for meeting and exceeding STC and ASTC requirements without complex techniques such as isolation clips or resilient channels. This system also helps reduce material usage versus traditional gypsum systems that require numerous layers of drywall. The results of this system are smarter sound control project cost savings and optimal indoor environmental quality for the well-being of building occupants–a combination that should be included on all of your projects. For more information please click here. We have many other tested assemblies that will fit your project needs; please contact the writer or our regional architectural solutions managers or call our toll free Professional Line 800-233-8990. Bob Marshall is building science manager for CertainTeed Gypsum Canada and can be reached at robert.marshall@saint-gobain.com. He has been appointed by NRC to the Standing Committee on Energy Efficiency in Buildings.